Shazam! Love it. Guzzled before Thanksgiving dinner. Straw yellow in the glass with pinpoint bubbles. Nose is yeasty/bready, with lemon, green apple, vanilla and orange blossom scents. Decadence! On that palate, it’s very clean with a sharp tart lemon and some granny smith apple. There’s a hint of bread dough, which persists on the palate and develops into a yeasty bite on the finish. Refreshing but complex; very well balanced and delicious. You can not go wrong with sparkling wine, my friends! It pairs with everything, including eggs, and even cheers up Eeyore. Gloria Ferrer is one of my favorite California sparkling houses; you can’t beat them for classy bubbly at a temptingly reasonable price. Did I ever tell you about the time in the Virgin Islands when I was invited to some long-time residents’ traditional Christmas Day Champagne Brunch, in which every guest had to bring a bottle of bubbly? Great food, great wine… and that was the day I learned that 5 bottles of sparkling wine is too many. (I learned this valuable lesson that afternoon and late into the evening as I lay on the bathroom floor of my apartment, waiting for the plumbing to stop swirling around me.) It’s good to know how much is too much, and now I know to stop at four bottles of bubbly. Heed my warning, gentle reader: stop at four. Gloria Ferrer the person is married to Jose Ferrer, whose family owns the honkin’ huge cava house Freixenet. Evidently Jose and Gloria vacationed in Sonoma in the 80s and liked what they saw, so they founded the first sparkling wine house in Carneros in 1986. The winery has a strong emphasis on research; they seem to have spent lots of time finding just the right clones of Chardonnay and Pinot Noir for their 335 acres of vineyards. They make still wine now, too, though I’ve never tried it. 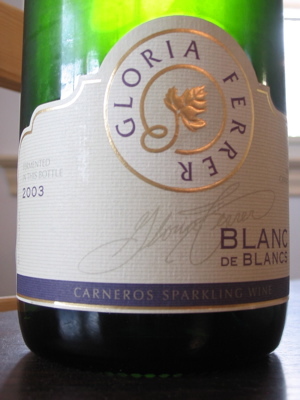 To reiterate, I think Gloria Ferrer makes some of the classiest California sparklers you can buy for the money. There is other Cali bubbly I enjoy and admire enormously, but when I want to drink a $14.76 bottle that fizzes like I dropped $30, GF is my BFF, for sure. Picked this one up as a 6th wine to round out my discounted half-case at Grapevine Market for about $10.50. I’m a huge fan of this varietal combination, so I was curious to see what a Yalumba would do with it. Deep purpley-red in the glass. Whopper of a nose with blackberry, roasted meats, a powdery floral note like perfumed dusting powder, slight tar and some menthol. Lots going on in the olfactory realm here; I love that top note that Viognier gives to Shiraz when they blend, and this had it, though not in spades. On the tongue there was some tart cherry or unripe blackberry, with some tarry or possibly graphite notes. The mid-palate was rather lacking here, but not a bad wine for the money at all. 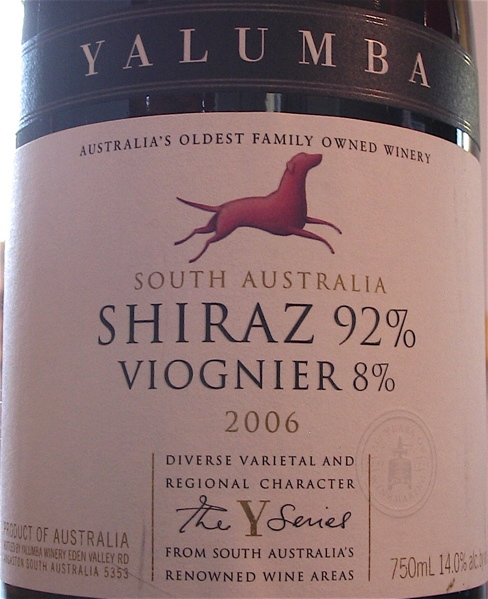 Deb’s Key West Wine & Gardening blog reviewed the 2005 Yalumba Shiraz-Viognier, quite favorably, and What To Drink Tonight liked the 2004 as well, so you can see that this is a pretty reliable producer, year to year. Yalumba bills itself as Australia’s oldest family owned winery, and I must say I’ve always been quite impressed with their price-quality ratio. Founded in 1849 by English brewer Samuel Smith in the Barossa Valley, the name of the winery means “all the land around” in the one of the aboriginal languages. Evidently Yalumba was the first to commercially plant Viognier in Australia, in 1980. I do like their Y Series Viognier, which is from the Eden Valley, and is a great value. The practice of blending red Syrah and white Viognier to make one wine comes from the Cote Rotie, in the northern Rhone Valley in France. The Cote Rotie region is famous for some of the world’s finest Syrah bottlings, and wine laws there allow for up to 20% of the red wine to be Viognier. Check Wine Library TV’s review of 4 Cote Roties here. In practice these days, most Cote Roties are 100% Syrah; but I must say I dearly love how Viognier can act as a Wonder-Bra for Syrah, lifting and separating, as it were, the Syrah’s floral components, while adding its own rich floral element. There’s something very yin-yang about these two grapes, and I’ll make jump into that tao every chance I get.